last night miss k came over for dinner and a movie. paper heart. oh my loveliness. it is so cute and funny. rent it. now. it's kind of a mix between a documentary on love and a romantic comedy. michael cera plays the love interest and he is so darling. you're not sure if you want to give him a smooch or a noogie. and charlyne yi is so quirky and...well, quirky pretty much sums her up. she's great and so funny. we laughed and talked and ate chocolate and rewound (rewinded?) our favorite scenes to watch them again and again. it was so fun and refreshing. plan a date night with your girlfriend this week. That movie is SO cute!! Chad was not impressed but I loved it! Totally love when he plays that trick on her in the restaurant. wow, can't believe i've never heard of this movie. it sounds really cute! must plan a date night with my girls pronto! i kept seeing this on my netflix...wondering if it was any good. i will have to add it to the que. 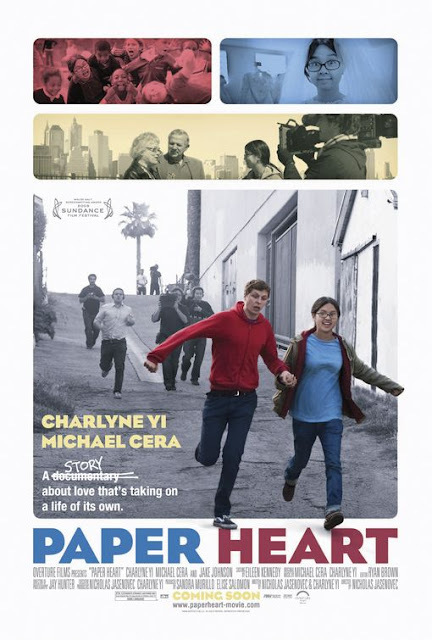 Paper Heart was fantastic. Such a cute documentary.